Cooking with Kids ~ Easter Lollipops! While shopping at Toys R Us on the Saturday before Easter I found the Wilton Lollipop kit on sale already reduced. I thought it would be nice to do this with my daughter for Easter. Just look at how cute the kit is... of course I couldn't pass it up when it was already reduced. It is hard to pass up at a regular price let alone a reduced price. My helper complete with Blue Lollipop! My little helper put all the melting disks into the bags for me and then I in turn melted them. She loved helping me knead them in the bag to make sure they were all smooth so we could put it into the trays. My daughter loved squeezing the bags and putting the "icing" as she called it into the molds to make the suckers and treats. The end result was so cute little lollipops everyone to enjoy. 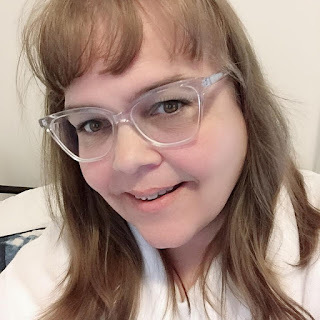 This blog post is linked up at Thrifymommastips why don't you go over and take a look at what is cooking on her blog this week.